Sung in every trouble and affliction of soul. During the first fortnight of August it is sung, alternating with the Great Canon of Supplication, joined to Vespers. In this case the opening blessing is omitted and the service begins immediately after the Song of Symeon, Now, Master, with Psalm 142. The Priest gives the blessing: Blessed is our God always, now and for ever, and to the ages of ages. Then at once the following Psalm. Lord, hear my prayer; in your truth give ear to my supplication, and in your justice hear me. Do not enter into judgement with your servant, for in your sight no one living can be justified. For the enemy pursued my soul; humbled my life to the ground; made me dwell in darkness, like those for ever dead. My spirit in me grew weary, and my heart was troubled within me. I remembered days of old; I meditated on all your works. I made the works of your hands my meditation. I stretched out my hands towards you; my soul thirsted for you like a waterless land. Hear me swiftly, O Lord; my spirit has failed. Do not turn your face from me, or I shall be like those who go down to the Pit. Make me hear of your mercy in the morning, for I have hoped in you. Make known to me the way in which I should walk, for to you I have lifted up my soul. Deliver me from my enemies, Lord; I have run to you for shelter. Teach me to do your will, for you are my God. Your good Spirit will guide me in an upright land. For your name’s sake, O Lord, you will give me life. In your justice you will bring my soul out of trouble; in your mercy slay my enemies, and destroy all those who afflict my soul, for I am your servant. After the Psalm we sing the following in Tone 4. Verse 1: Give thanks to the Lord, for he is good: his mercy endures for ever. Verse 2: All the nations surrounded me, but in the name of the Lord I drove them back. Verse 3: This is the Lord’s doing, and it is marvellous in our eyes. Tone 4. Lifted up on the Cross. Now to God’s Mother let us humble sinners run in haste and in repentance let us fall down before her feet, crying aloud with fervour from the depths of our souls, ‘Sovereign Lady, help us now, have compassion upon us, hasten, for we perish from our many offences. Let not your servants go empty away; we have you as our only hope’. Glory. The same again, or the Apolytikion of the Church. Though most unworthy, may we never by silence fail to proclaim your mighty acts and accomplishments, for if you do not stand to intercede for us all, Mother of our God, who then will preserve us in freedom? Who would have delivered us from such terrible dangers? O Sovereign Lady, from all kinds of threats you save your servants, may we not abandon you. Then Psalm 50, read by the Reader. Have mercy on me, O God, in accordance with your great mercy. According to the multitude of your compassion blot out my offence. Wash me thoroughly from my wickedness, and cleanse me from my sin. For I acknowledge my wickedness, and my sin is ever before me. Against you alone I have sinned and done what is evil in your sight, that you may be justified in your words and win when you are judged. For see, in wickedness I was conceived and in sin my mother bore me. For see, you have loved truth; you have shown me the hidden and secret things of your wisdom. You will sprinkle me with hyssop and I shall be cleansed. You will wash me and I shall be made whiter than snow. You will make me hear of joy and gladness; the bones which have been humbled will rejoice. Turn away your face from my sins and blot out all my iniquities. Create a clean heart in me, O God, and renew a right Spirit within me. Do not cast me out from your presence, and do not take your Holy Spirit from me. Give me back the joy of your salvation, and establish me with your sovereign Spirit. I will teach transgressors your ways, and sinners will turn to you again. O God, the God of my salvation, deliver me from bloodshed and my tongue will rejoice at your justice. Lord, you will open my lips, and my mouth will proclaim your praise. For if you had wanted a sacrifice, I would have given it. You will not take pleasure in burnt offerings. A sacrifice to God is a broken spirit. A broken and a humbled heart God will not despise. Do good to Sion, Lord, in your good pleasure, and let the walls of Jerusalem be rebuilt. Then you will be well pleased with a sacrifice of justice, oblation and whole burnt offerings. Then they will offer calves upon your altar. And we begin the Canon. A Composition by Monk Theostiriktos, or, as some say, Theophanes. Ode 1, Tone 8. The Irmos. By many temptations I am held fast, and seeking salvation come for refuge in flight to you O Mother of God’s own Word and Virgin, from my dread dangers and troubles now rescue me. presses heavily on my soul, with the calm of your Son and God, pure Maiden, O All-immaculate Virgin, now give me peace. it is to you that I lift both my soul and mind. In body and soul, sick as I am, consider me worthy, only Mother of our true God, of your godly providence and kindness, for you are good and the one who gave birth to Good. You constructed the heavens’ high vault, O Lord, and the Church, has you as its builder, do you establish me in your love, you are the pinnacle of all desires, and foundation, mankind’s only Lover, of all who believe in you. you the support of the faithful, source of all good things, you alone the one all-praised. I entreat you, O Virgin, dispel the strife in my soul, pacify, I pray you, the tempest of my despondency, for you, O Bride of God, gave birth to him who is calm’s source, you gave birth to Christ, you alone are the one all-praised. is yours who bore Christ the mighty, powerful in strength is he, O greatly blessed by God. the inexhaustible treasure, never failing storehouse, of healings that have no price. Save your servants, from every danger, O Mother of God, for next after God we all fly for refuge to you as unbreachable wall and protection. With kindness, all-praised Mother of God, look on the dire affliction of my body and heal the pain of my soul. Then the Litany of supplication. Priest: Have mercy on us, O God, according to your great mercy, we pray you, hear and have mercy. People: Lord, have mercy (three times after each petition). Priest: Also we pray for our Archbishop N., and for all our brotherhood in Christ. Also we pray for mercy, life, peace, health, salvation, visitation, pardon and forgiveness of sins for the servants of God, all devout and Orthodox Christians, those who dwell in or visit this city and parish, the wardens and members of this church and their families. Also we pray for the servants of God who make this supplication, and for the servants of God (and he commemorates the names of those for whom the supplication is being made). People: Lord, have mercy (x3 or x12). Priest: For you, O God, are merciful and love mankind, and to you we give glory, Father, Son and Holy Spirit, now and for ever, and to the ages of ages. Kathisma. Tone 2. Seeking things on high. Invincible rampart, fervent intercession, the wellspring of mercy, refuge of the world, to you we all cry insistently, ‘Sovereign Lady, Mother who bore our God, hasten, from perils swiftly set us free, alone you are ever swift in our defence’. I have heard, Lord, the mystery of your dispensation, I heard and was afraid, I have meditated on your works and exalt and glorify your Deity. I entreat you, O Bride of God, still my passions’ tumult, the tempest of my faults, still the raging turmoil in my soul; you who brought to birth my pilot and my Lord. As I call on you grant to me your compassion’s depths, let me know your tenderness, you who bore the Saviour of all those who now lift their voices and who sing your praise. as we offer you our hymns of thanks, for your many gracious gifts which we enjoy. As our hope and assurance, rampart of salvation which none can overthrow we have gained you, highly honoured one, and from every trouble you deliver us. Lord, enlighten us, with your ordinances and commands, and with your upraised arm grant unto us your peace, for you alone, O Lord, are Lover of humanity. Fill my heart, I pray, with your gladness and unsullied joy, Virgin most pure, the only Mother of our God, for you who gave birth to him who is the cause of gladness. Come, deliver us from all dangers, Mother of our God, you bore eternal liberation, Maid most pure, the peace which passes all understanding came to birth from you. Dissipate the fog, Bride of God, the murk of my misdeeds, with the illumination of your radiance, you who gave birth to the divine and pre-eternal light. Heal me, O Most Pure, heal the sickness that afflicts my soul, making it worthy of your kindness and your care, and by your fervent intercession grant me health, I pray. from the malice of foes to deliver me. I know you to be my life’s sure guardian its protection and shield, O pure Virgin, you who dispel the great throng of temptations, and drive away assaults of demon hordes, unceasingly I plead with you, ‘From the passions’ corruption deliver me’. from the passions and dangers besetting us. to him who frees us from sickness and malady, O good one, hear me, I implore, ‘From disease’s corruption now raise me up’. Immaculate, who through a word gave birth to the Word beyond explanation in the last days, make intercession, as you have a mother’s freedom to speak. Then again the Litany of supplication. 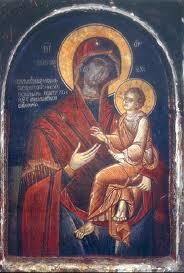 ‘Hasten to intercede, make speed to entreat, O Mother of God’, for you ever protect those who honour you. By the Holy Spirit every soul is given life, by cleansing it is exalted, it is made bright by the threefold Unity in a sacred mystery. By the Holy Spirit the streams of grace well up, watering all creation to engender life. Then the Prokeimenon in Tone 4. Psalm 44. I will remember your name throughout all generations (x2). Verse: Listen my daughter and see, and incline your ear, and forget your people and your father’s house, and the King will desire your beauty. I will remember your name throughout all generations. Priest: And that he would count us worthy to listen to the holy Gospel, let us pray to the Lord God. People: Lord, have mercy (x3). Priest: Wisdom, stand upright. Let us listen to the holy Gospel. People: And to your Spirit. People: Glory to you, O Lord, glory to you! In those days Mary arose and went with haste into the hill country, to a city of Juda, and she entered the house of Zachary and greeted Elizabeth. And when Elizabeth heard Mary’s greeting, the infant leaped in her womb; and Elizabeth was filled with the Holy Spirit and she exclaimed with a loud cry, ‘Blessed are you among women, and blessed is the fruit of your womb! And why is this granted me, that the mother of my Lord should come to me? For see, when the voice of your greeting came to my ears, the infant in my womb leaped for joy. And blessed is she who believed that there would be a fulfilment of what was spoken to her from the Lord.’ And Mary said, ‘My soul magnifies the Lord, and my spirit has rejoiced in God my Saviour, for he has regarded the low estate of his handmaiden. For behold, from henceforth all generations will call me blessed; for he who is mighty has done great things for me, and holy is his name. And Mary remained with her about three months, and returned to her own house. Glory to the Father and to the Son and to the Holy Spirit. Tone 2. Father, Word and Spirit, Trinity in Unity, blot out the multitude of my transgressions. Both now and for ever and to the ages of ages. Amen. Through the prayers of the Mother of God, O Merciful One, blot out the multitude of my transgressions. Have mercy on me, O God, according to your great mercy; according to the fullness of your compassion blot out my offence. Tone 6. Having placed all your hope. Sovereign and all-holy one, do not trust me to protection which is merely human, but accept the pleading of your supplicant, anguish has hold of me, nor can I endure the hostile demons’ arrows; no shelter can I find, no, nor place of refuge, wretch that I am, from every side I am assailed, and, save you, I find none that offers solace, Queen of all creation, Protection of the faithful and our hope, do not despise my entreaty, but take action for my good. Other Theotokia in the same Tone. No one who has recourse to you goes from your presence put to shame and rejected, Mother of God, pure Virgin, but asking for grace they receive gifts and benefits most advantageous to the plea they make. For the afflicted, transformation and liberation for the ailing are you, O Mother of God, most pure Virgin: save your City, save us all. To all those embattled, you are peace, you are calm to those tossed by the tempest the one Protection of the faithful. O God, save your people and bless your inheritance, visit your world with mercy and pity, exalt the horn of Orthodox Christians and send down upon us your rich mercies; at the prayers of our all-pure Lady, Mother of God and Ever-Virgin Mary; by the power of the precious and life-giving Cross; at the protection of the honoured Bodiless Powers of heaven; through the intercessions of the honoured, glorious Prophet, Forerunner and Baptist John, of the holy, glorious and all-praised Apostles; of the holy, glorious and triumphant Martyrs; of our venerable and Godbearing Fathers and Mothers; of Saint N. [the patron of the Church]; of the holy and righteous Forebears of God, Joachim and Anne, of Saint N., whose memory we celebrate [the Saint of the day], and of all your Saints, we beseech you, only merciful Lord, hearken to us sinners as we pray to you and have mercy on us. Singers: Lord, have mercy (x12 in groups of three). Priest: By the mercy and compassion and love towards mankind of your only-begotten Son, with whom you are blessed, together with your all-holy, good and life-giving Spirit, now and for ever, and to the ages of ages. Singers: Amen. And we continue with the rest of the Canon. 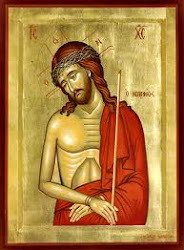 As you bore Christ the Saviour for our sake, deign to heal from all sicknesses of the soul and weakness of the body those who with love and longing, O most pure, who gave birth to God, come close to you, to draw near to your divine protection. The King of heaven, whose praise the Angels are singing, all the hosts of the bodiless powers praise him and exalt him most highly to all ages. Do not despise those who beg your help, O pure Virgin, as their raise their song up in your honour, praising and exalting you, Maiden, to the ages. Unending rivers of healings you pour, O Virgin, r all those who him and extol and praise you, those whose songs exalt your Birth-Giving beyond language. You cure, O Virgin, all my soul’s weakness and sickness, and the flesh’s tormenting afflictions, so that I may sing of your glory, Highly Favoured. The passions’ onslaughts and the assaults of temptations you, O Virgin, repel and drive from us, wherefore we shall praise and hymn you to all ages. We who through you, O Virgin, have been saved confess you to be most truly the one who gave birth to God, with all the choirs of the heavens you we now magnify. Do not reject my weeping, tears that flow unceasing, for you, O Virgin, gave birth to our Saviour Christ, and it he who has wiped every tear from every face. Come, fill my heart, O Virgin, fill my heart with gladness, for you received in his fullness the joy of all, and made the pain and the sadness of sin now disappear. O Virgin, be the haven, shelter and protection of those who flee to you, rampart unshakeable, may they have as their refuge, their gladness and their joy. Dispel the fog of error, ignorance’s darkness, and let your light’s rays, O Virgin, illumine those who with devotion proclaim you the Mother of our God. Heal one laid low and wretched, in a place of sickness, a place, O Virgin, of ill and of wretchedness, grant transformation from weakness and feebleness to health. Then the Megalynaria, during which the Priest censes. It is truly right to call you blessed, who gave birth to God, ever-blessed and most pure, and Mother of our God. Greater in honour than the Cherubim and beyond compare more glorious than the Seraphim, without corruption you gave birth to God the Word; truly the Mother of God, we magnify you. Higher than the heavens is she by far, and yet more resplendent than the sun with its blazing rays, she who has delivered us from the curse’s power, in hymns now let us honour her who rules all the world. From the swarming multitude of my sins, oth my soul and body are now weakened, they are both sick, O Most Highly Favoured, to you I fly for refuge, the hope of those who have none, grant me, I pray you, your help. Mother of the One who redeemed us all, hear the supplications your unworthy household makes, be our intercessor with him, the One born from you, the world’s true Sovereign Lady, become our Advocate. Fervently and joyfully we now sing hymns and odes to you, the all-praised Mother of our God, with the Lord’s Forerunner and all the Saints in heaven, implore your Son, O Mother, to show us pity now. Let the impious’ lips be bereft of speech, who do not worship this your icon, the all-revered, this which was depicted by Luke, the Lord’s Apostle, the icon with the title, ‘She who points out the Way’. The Megalynarion of the Patron of the Church. All you hosts of heaven, the Angel Bands, John, the Lord’s Forerunner, the Apostles, the holy Twelve, Saints beyond all number, with our God’s own Mother, make intercession for us, that we may all be saved. Reader: Holy God, Holy Strong, Holy Immortal, have mercy on us (three times). Glory to the Father, and to the Son, and to the Holy Spirit; both now and for ever, and to the ages of ages. Amen. All-holy Trinity, have mercy on us. Lord, cleanse us from our sins. Master, pardon our iniquities. Holy One, visit and heal our infirmities for your name’s sake. Lord, have mercy. Lord, have mercy. Lord, have mercy. Our Father, in heaven, may your name be hallowed, your kingdom come; your will be done on earth as in heaven. Give us today our daily bread, and forgive us our debts, as we forgive our debtors, and do not lead us into temptation, but deliver us from the evil one. Priest: For yours is the kingdom, the power and the glory, of the Father, the Son and the Holy Spirit, now and for ever, and to the ages of ages. If the Service of Supplication is sung by itself without Vespers, or outside the first fortnight of August, then the following are sung. Troparia of Compunction. Tone 6. Have mercy on us, Lord, have mercy on us; for we sinners, lacking all defence, offer you, as our Master, this supplication: have mercy on us. Lord, have mercy on us, for in you we have put our trust. Do not be very angry with us, nor remember our iniquities. But look on us now, as you are compassionate, and rescue us from our enemies. For you are our God, and we are your people; we are all the work of your hands, and we have called on your name. Open the gate of compassion to us, blessed Mother of God; hoping in you, may we not fail. Through you may we be delivered from adversities, for you are the salvation of the Christian race. If, however, the Service is sung as part of Vespers, or during the first fortnight of August, then the Apolytikion of the day, together with the appropriate Theotokion, is sung. Also we pray for the protection of this city and land from plague, famine, earthquake, flood, fire, sword, invasion by enemies, civil war and sudden death; and that our good God, who loves mankind, will be merciful, kindly and easily entreated, will turn away and dispel all wrath and disease stirred up against us, and deliver us from his just threat that hangs over us, and have mercy on us. Priest: Also we pray that the Lord, our God, will hearken to the voice of supplication of us sinners and have mercy on us. Reader: Lord, have mercy (x3). Priest: Hear us, O God our Saviour, the hope of all the ends of the earth and of those far off on the sea; and show pity, show pity, Master, on our sins, and have mercy on us. For you, O God, are merciful and love mankind, and to you we give glory, to the Father, the Son and the Holy Spirit, now and for ever, and to the ages of ages. Priest: Glory to you, Christ, God, our hope, glory to you. Reader: Glory. Both now. Lord, have mercy (x3). Holy Father, bless. Priest: May Christ our true God, through the prayers of his all pure and holy Mother, the intercessions of the holy glorious, all-praised Apostles, (of the Saint of the church and of the day) and of all the Saints, have mercy on us and save us, for he is good and loves mankind. While the Christians kiss the Icon of the Mother of God, we chant the following Troparia. Tone 2. When from the Tree. All those, loving Virgin, you protect, with your mighty hand, who in faith come to seek refuge with you; for we sinners, bowed beneath the weight of many faults, have no other who in our dangers and our afflictions is ever-present intercessor before God, Mother of God, the Most High, whence we fall before you, ‘Deliver all your servants in every predicament’. shield, defence and aid are you, the orphan’s succour and help, Mother of our God the Most High, hasten, All-Immaculate, hasten, hear our prayer, deliver all your servants. Accept the pleadings of your servants, O Lady, and rescue us from every constraint and affliction. All my hope I lay on you, Mother of God. Guard me beneath your protection. During the first fortnight of August it is customary to sing, instead of the preceding Theotokia, the following Exapostilaria. Tone 3. As God you adorned the heavens. Apostles, you assembled here brought here from the earth’s furthest limits, here in the bounds of Gethsemane I bid you inter my body. And you, my Son and my God, my dear Son, receive my spirit. O sweetness of the Angels, the joy of all those in distress, the Virgin Mother of the Lord, you are the protection of Christians, come to my aid, deliver me from the eternal torments. For you I have as advocate before the God who loves mankind, do not expose what I have done before the sight of the Angels, and I entreat you, O Virgin, pray, come to my aid, come swiftly. O Tower wreathed in gold, O glorious Twelve-walled City, The Throne from which the sun pours down, the Seat of the King of all, O wonder beyond understanding! How is it you suckle the Master? Through the prayers of our holy fathers, Lord Jesus Christ our God, have mercy on us. Αναρτήθηκε από amphilochios στις 8:26 μ.μ.